The ASLA public awareness campaign launched the Year of Public Service (YPS) in 2013 for two reasons. First, the campaign encouraged ASLA members to ramp up existing pro-bono efforts. Second, ASLA wanted to highlight the great service projects already done by landscape architects across the country. A year later, the YPS blog boasts nearly 50 projects, with more still trickling in. Just a few examples: in the past year, landscape architects have created a new scenic trail plan; designed a healing, sensory garden; built a butterfly and bird habitat; and launched a community space, all for deserving communities. Many projects, like the Great Shasta Rail Trail (GSRT), took advantage of longstanding relationships between ASLA chapters and the National Park Service Rivers, Trails, and Conservation Assistance Program. See the video above. The vision for the project was to develop an 80-mile scenic, multi-use trail along the existing rail bed between the towns of McCloud and Burney, near Mt. Shasta, California. The workshop addressed the project’s many design challenges while generating concepts that can be used to communicate with the public. 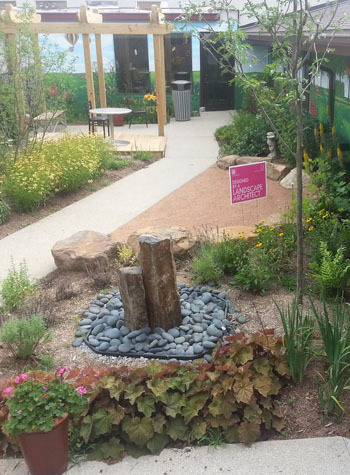 The Indiana Chapter of ASLA designed and installed a sensory garden for a non-profit, Outside the Box (OTB). Located on the north side of Indianapolis, OTB is a provider of day, employment, and art services to individuals with intellectual and developmental disabilities. OTB views their 200 patrons as capable individuals who can enrich their own lives through contributions to their community. The chapter’s public service committee visited OTB to observe a typical day while meeting staff and participants, and decided to host a design charrette for a new sensory garden. Last April, Indiana ASLA held a one-day work session during National Landscape Architecture Month. ASLA Indiana voted to provide maintenance funds to OTB to keep the garden looking beautiful year after year. Also featured on the blog are many member submissions. Michael Gilkey, ASLA, was integral to establishing an edible garden along with a bird and butterfly garden in Sarasota, Florida. He even lead kindergarten classes in the creation of their own shoebox butterfly gardens. 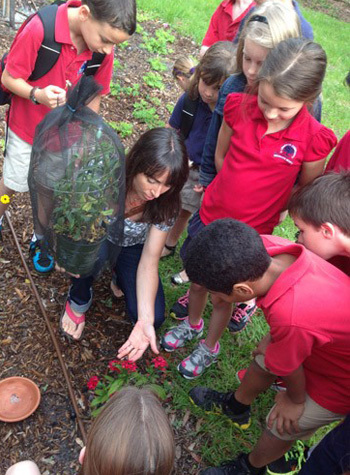 Southside Elementary Eco-Garden Co-Chair Emily Morgan helps a third grade class release their own hatched monarch into the newly certified butterfly and bird habitat garden / Michael A. Gilkey, Inc. When the garden team of the Southside elementary school approached Gilkey about the dire need to redo the front school façade, he volunteered his time and designs to create a butterfly and bird habitat garden that would welcome students and parents into the historic building. The garden was planted in early 2013, and is now considered a certified wildlife habitat. 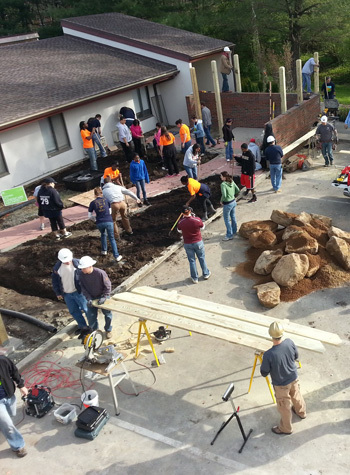 Thanks to the students who attended LABash 2013, an annual landscape architecture student symposium, Athens-area Habitat for Humanity created a new community space at The Foundation, an apartment complex, in an area once riddled with crime. Athens Habitat bought The Foundation property, renovated the units, and created a haven for deserving families to call home. The students who participated in this year’s LABash were encouraged to team up and submit a plan for a community space in a quick-fire competition organized by the University of Georgia Center for Community Design and Preservation. At least 60 students from 18 universities competed. The submissions were judged by a panel of experts comprised of sponsors, UGA faculty, Habitat staff, and Tom Tavella, FASLA past-ASLA president. The competition allowed students to gain real design experience, while strengthening ties between UGA and Athens businesses and nonprofits. Once the winning teams were chosen, construction commenced. ASLA’s chapters, members, and students are making the country a better place, but this is nothing new. 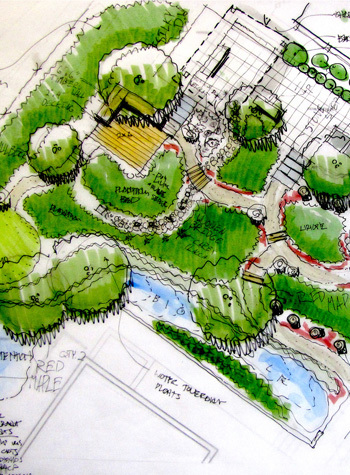 Many landscape architects do pro-bono projects every year. This campaign just highlighted those efforts. See all YPS projects. Landscape Architects Serve the Public | The Dirt <Liked it!